Nearly 1,000 Kaneohe Marines will be part of the ground security force in central and eastern regions of Afghanistan in two weeks. Yesterday, an advance party of 80 Marines from the 3rd Battalion, 3rd Marine Regiment — known as “America’s Battalion” — left Kaneohe Bay for what they hope will be only seven months. Cooling said his unit will be covering “a very large area of responsibility” and that the Kaneohe Marines will be relieving the 3rd Battalion, 6th Marine Regiment, which has been assigned to Combined Task Force Thunder and will be returning to its home base at Camp Lejeune in North Carolina. Gunnery Sgt. Stephen Muller will be on his first combat deployment since joining the Marine Corps 14 years ago. The seven-month deployment will mean he will miss three ballet recitals of his 12-year-old daughter, Mariah, and several cheer-leading competition events for another daughter, Lindsey, 11. His wife, Tamara, decided to celebrate Christmas early this year and bought the family two digital cameras to help stay in touch. “We’ll send him photos by e-mail and short video clips of the recitals and cheer-leading competitions he will miss,” she said. For Gunnery Sgt. Joseph Yantosca and his wife, Cynthia, the deployment means they will miss celebrating their 13th wedding anniversary on Dec. 19. So, the couple went out and bought a diamond ring before he left yesterday afternoon. “This is to replace a diamond I lost on my wedding band when we were moving to Hawaii,” said Cynthia Yantosca. The couple had just begun getting settled in when her husband was told that his unit would be going to Afghanistan. The rest of the unit will leave within two weeks. Earlier this month, nearly 1,000 members of Kaneohe’s 1st Battalion, 3rd Marine Regiment, entered Iraq as the ground combat support element of the 31st Marine Expeditionary Unit. They will be in western Iraq, patrolling the areas of Fallujah and Ramadi west of Baghdad for seven months. On Oct. 24 the 1st Battalion reported its first casualty in Iraq when Lance Cpl. Richard P. Slocum, 19, of Saugus, Calif., was killed near Abu Ghraib in a Humvee accident. Cooling said his Kaneohe Marines will be one of the major ground security force elements of Combined Joint Task Force-76, which is commanded by Maj. Gen. Eric Olson, head of the 25th Infantry Division, at Bagram Air Field. Olson assumed command on April 15. Kaneohe Marines with the 3rd Battalion, 3rd Marine Regiment, began leaving Windward Oahu yesterday for seven months in Afghanistan as the U.S. war effort continued to dig deep into Hawaii’s military community. By the end of the week, all 900 members of the battalion will be at Bagram air base, about 27 miles north of Kabul. Yesterday’s departure came on the same day that the Kaneohe base held an emotional memorial service for 10 fallen comrades. The 900 departing Marines are in addition to previous Hawaii deployments, including 10,000 Schofield Barracks Army soldiers — 4,500 in Iraq and more than 5,000 in Afghanistan. In Iraq another 900 Kaneohe Marines from the 1st Battalion, 3rd Marine Regiment, are in the brunt of the fight in Fallujah trying to retake the city from insurgents. They arrived in Iraq in mid-October as members of the 31st Marine Expeditionary Unit. Already, eight of them have been killed. Col. James Patterson, who commands the 3rd Marine Regiment, said yesterday that his one remaining combat unit, the 2nd Battalion, is preparing for a tour in Afghanistan. “They will be replacing the unit that is leaving today for Afghanistan,” he said. Patterson said the 2nd Battalion recently returned from the Pohakuloa Training Area and will go back to the Big Island for more combat training early next year. The unit will then be sent to Southern California for 30 days before leaving for Afghanistan in June. By early next summer, all of the 25th Infantry Division soldiers will be home from Iraq and Afghanistan, but 2,200 citizen soldiers from the Hawaii Army National Guard’s 29th Infantry Brigade will have replaced them in Iraq. 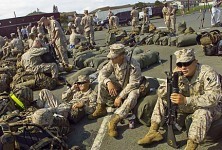 In Afghanistan nearly 1,000 Kaneohe Marines will be still be there for seven months. Chief Petty Officer Gene Deener will be on his fourth combat tour when he arrives in Afghanistan today. The Navy corpsman has fought in Grenada, Panama and the 1991 Gulf War. “Leaving my family is always the hard part because the rest is easy,” said Deener, who has two children, Molly, 6, and Jacob, 10. Deener, who is in charge of 64 Navy hospital corpsmen, is chief corpsman for the 3rd Battalion. For Lance Cpl. Kyle Davis, 22, it will be his first separation from his wife, Patricia, whom he married six months ago. Sgt. Adam O’Malley’s departure yesterday was just four days before his son’s fourth birthday. 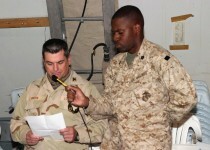 Jonathan Hill (R), Manas Air Base, November 11, 2004.